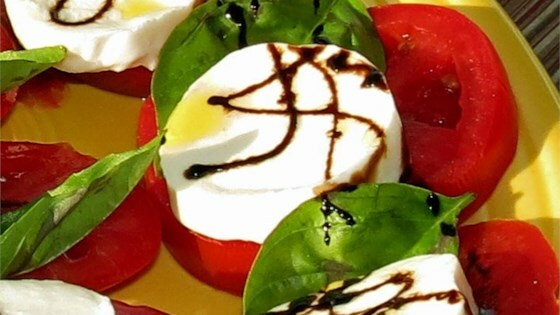 "Tomatoes, fresh mozzarella, and basil drizzled with a sweet balsamic reduction and olive oil. Easy, impressive and delicious! Most grocery stores now sell prepared balsamic reductions. Surprisingly it's just as good!" Stir balsamic vinegar and honey together in a small saucepan and place over high heat. Bring to a boil, reduce heat to low, and simmer until the vinegar mixture has reduced to 1/3 cup, about 10 minutes. Set the balsamic reduction aside to cool. Arrange alternate slices of tomato and mozzarella cheese decoratively on a serving platter. Sprinkle with salt and black pepper, spread fresh basil leaves over the salad, and drizzle with olive oil and the balsamic reduction. A layered salad of tomatoes and cheese drizzled with balsamic vinegar reduction. This recipe was excellent. Now that I know how easy it is to make a Balsamic Reduction, I will be making it more often. Easy, yummy, loved by all. What else is there to say?